Here is a screen shot of what multiplication I did. 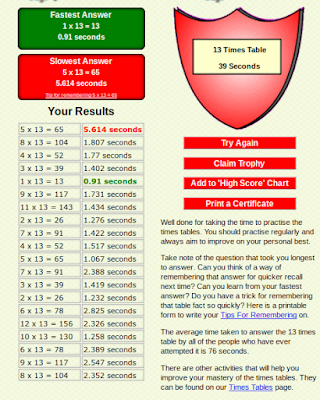 I practiced my 13 time tables and it was difficult but after trying it a few times I got the hang of it. In my screen shot I took it shows the answer the I answered the fastest and the slowest. So my fastest answered question was 1 x 13 and my slowest was 5 x 13. In the right hand corner it shows you/me how long it took me to answer all questions. It took me 39 seconds. Next time I will make sure that I practice in getting a faster time. At the bottom it shows my results. So this is my score for today and if you want to play and practice your time tables click the link HERE and it will take you straight to the site.